Lives were on the line on Legacies Season 1 Episode 16, but who made the ultimate sacrifice? Read our full review of the season finale to get up to speed. On Legacies Season 1 Episode 15, Landon learned the truth about his past and made a decision about who to side with. Read the full review of a wild installment. It's time for the annual Miss Mystic Falls on Legacies Season 1 Episode 14. Will Lizzie or Josie follow in their mother's footsteps? Find out! Legacies Review: Who Returned From the Dead? On Legacies Season 1 Episode 13, Landon's power was finally revealed, while someone died in the battle. We have the full review of a crazy episode! On Legacies Season 1 Episode 12, Alaric rounded up the students and teachers to locate the missing urn, but what did TRIAD Industries want with them? Read on for the review! On Legacies Season 1 Episode 11, dangerous slugs invade the minds of the students and teachers. Who turns to the dark side? We have the full review. On Legacies Season 1 Episode 10, Lizzie made some wishes and changed the entire world in the process. We have the full review of the best episode of the season. Legacies Review: What Was Hope Doing In Your Dreams? A dream demon invaded the school on Legacies Season 1 Episode 9, and it nobody was safe. Plus, a new love triangle took flight inside the school. Read our review. Landon's life was on the line on Legacies Season 1 Episode 8, and it was up to Hope and Alaric to save him. What did they find out? Read our full review. Legacies Review: Did Hope Learn the Truth About Klaus? On Legacies Season 1 Episode 7, Hope learned the truth about where her father went when he died as another revelation about Malivore came to light. Read our review. Jo returned from the dead on Legacies Season 1 Episode 6, and moved the series in the right direction. Read on for the full rundown of the episode. 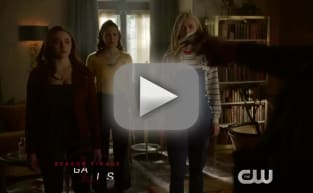 Legacies Review: Who is Landon's Mother? On Legacies Season 1 Episode 5, the truth about Landon's lineage came to the forefront, and it paved the way for the mother of all revelations.